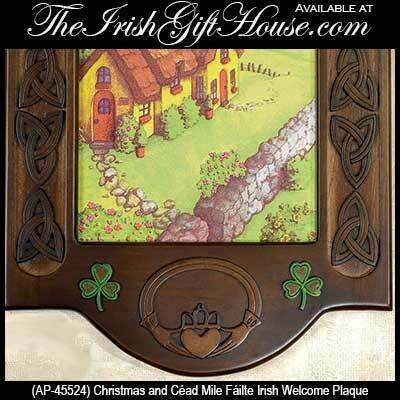 This wood carved Irish blessing plaque offers interchangeable welcome panels for both Christmas and summer greetings. The translations for the Irish language blessing plaque are Céad Mile Fáilte is Irish for One Hundred Thousand Welcomes and Nollaig Shona Dhuit is Irish for Happy Christmas to You. 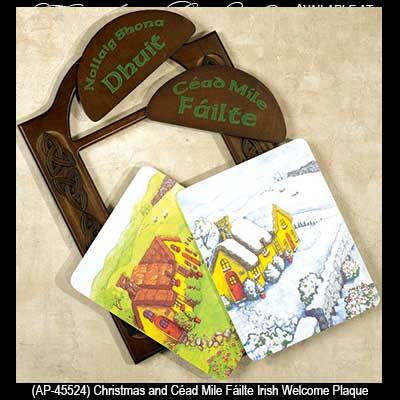 This double season Irish blessing plaque is great for Christmas and all year long by changing the inserts from the winter Irish cottage to the summer Irish cottage and the Nollaig Shona Dhuit panel to the Céad Mile Fáilte panel. The swivel tabs on the back makes the conversion quick and easy. This dual use Irish blessing frame is carved wood and features dimensional design Claddagh, shamrock, and Celtic knots; a history card is included for each Irish symbols. 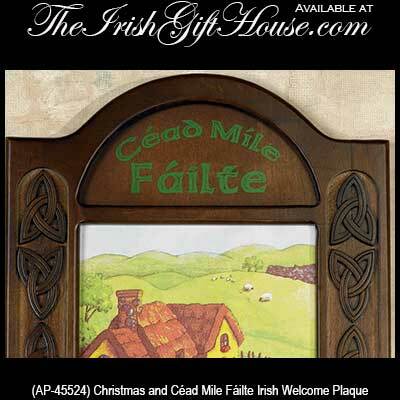 The Irish Christmas blessing and Céad Mile Fáilte welcome plaque measures 9" wide x 14" tall and is boxed. Céad Mile Fáilte with the summer cottage and Nollaig Shona Dhuit with the winter cottage are the four interchangeable seasonal art and blessing panels. This handsome plaque is uniquely designed to be a stylish part of your decor during the Christmas season and all year long.